Greetings! I am delighted you want to get married at St. Paul's Church in Troy. 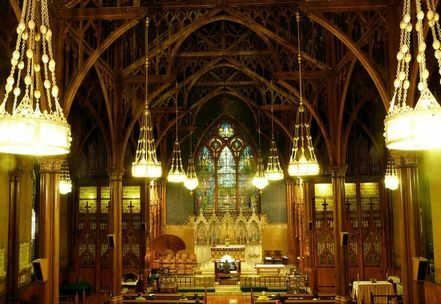 We get quite a number of requests each year from couples who would like to have their ceremony in our beautiful church. I would be honored to solemnize your marriage at St. Paul's Church. The parish would like to do everything we can to accommodate your desire to be married at St. Paul's Church. Below are the minimum standards for marriage at St. Paul's Church. That both parties are able to marry according to the laws of the state and the canons of the diocese. That at least one of the persons being married must be a baptized Christian. That both parties have been instructed in the meaning of marriage. That if one of the persons being married is divorced, permission must be obtained for re-marriage from the Bishop of Albany. 2. The couple must meet with the rector at least four times for marriage preparation. Please allow six months for marriage preparation and a rehearsal. 3. After the first marriage preparation meeting, if the couple and priest agree to continue, a date for the wedding service will be chosen. 4. The rector or his designee (an Episcopal Priest) will preside at the wedding. 5. Weddings are not held during Lent, Holy Week, Christmas Eve or Christmas Day. Finally, all information regarding, marriage license, fees, decorations, flowers, music, photography, etc. will be covered during the marriage preparation. If you are interested please contact me by email for more information or to make an appointment. Or give me a call at 518-273-7351, x. 4.